Some services have an expiration date when you must begin paying for them. 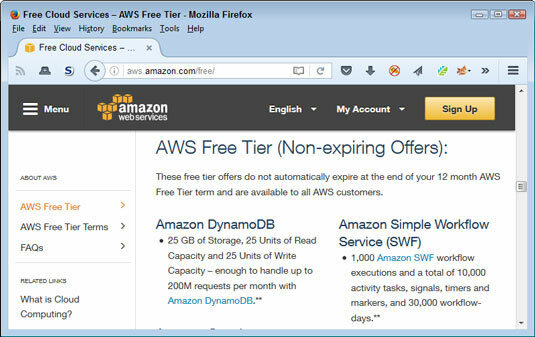 Many of the AWS services you obtain through the free tier have expiration dates, and you need to consider this limitation when evaluating and possibly using the service to perform useful work. The figure shows an example of a service with an expiration date. Notice that you must begin paying for the service 12 months after you begin using it. Software may be free, but the service on which it runs might not be. In some cases, the product itself doesn’t have an expiration date, but the service on which it runs does. 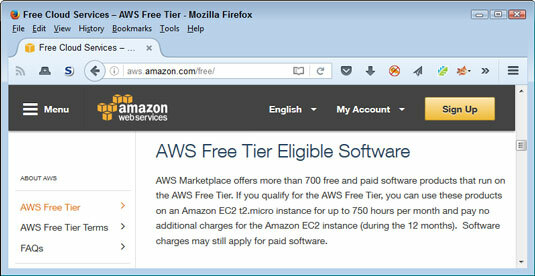 For example, when viewing the terms for using the free software, the software itself is indeed free. However, in order to run the software, you must have the required service, which does come with an expiration date. A few services don't come with expiration dates. You also have access to some products that are both free and have no expiration date. These nonexpiring offers still have limitations, but you don’t have to worry about using those products within the limits for however long you want (or until Amazon changes the terms). Figure 2-3 shows examples of these kinds of services. Knowing the terms under which you use a service is essential. The free period for services with an expiration date goes all too quickly, and you may suddenly find yourself paying for something that you thought remained free for a longer time frame. Given that Amazon can change the terms of usage at any time, you need to keep checking the terms of service for the services that you use. A service that lacks an expiration date today may have an expiration date tomorrow. Note that all these products have some sort of usage limit attached to them — even the free software — because of the software’s reliance on an underlying service. (Some software relies on more than one service, so you must also consider this need.) 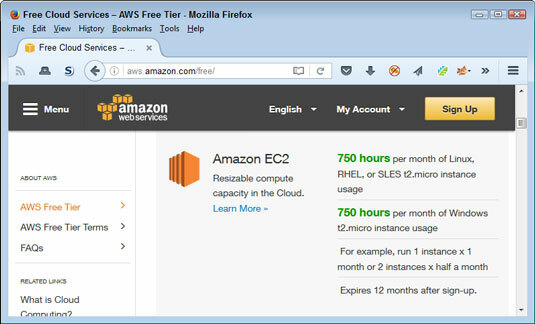 For example, you can use Amazon Elastic Compute Cloud (EC2) for 750 hours per month as either a Linux or Windows setup. A 31-day month contains 744 hours, so you really don’t have much leeway if you want to use the EC2 service continuously. The description then provides you with an example of usage. Amazon bases the usage terms on instances. Consequently, you have access to a single Linux or single Windows setup. If you wanted to work with both Linux and Windows, you would need two instances and could use them for only 15 days and 15 hours each month. In short, you need to exercise care in how you set up and configure the services to ensure that you don’t exceed the usage limits. The free, nonexpiring services also have limits. For example, when working with Amazon DynamoDB, you have access to 25GB of storage, 25 units of read capacity, and 25 units of write capacity. Theoretically, this is enough capacity to handle 200 million requests each month. However, whether you can actually use all that capacity depends on the size of the requests and how you interact with the service. You could easily run out of storage capacity long before you run out of request capacity when working with larger files, such as graphics. Again, you need to watch all the limits carefully or you could find yourself paying for a service that you thought was free.